Everyone, at some point in their lives, has passed Meredith Road. Maybe you've dipped under the landmark Ferodo Bridge heading out towards the A14, then got held up at some traffic lights: to the left a park, to the right a pricey BP garage. That petrol refillery stands sentinel to the Whitton estate, a part of town you've been told to avoid. Don't turn your engine off, they'll have told you, half-jokingly. It's an urban jungle out there. Course, being a local lends a somewhat different view. Which is why I unflinchingly suggested that we meet up at Al's Cafe on mean Meredith Road, sandwiched between the Bekash Tandoori and Quality Kebabs. Parking up there is an event predictable only by Derren Brown, but we landed a greengage of a spot right outside the caff. Handy for the odd over-the-shoulder check for the car, not that it goes with the neighbourhood. Long and thin is Al's with no shortage of seating. Like Kenny's, on the other side of town, the menus are lengthy and laminated. Yes, there's omelettes and jackets and baguettes and roasts, but a man comes here for an All Day Breakfast: it's merely a question of choosing which one. Each of the "set menus" offers a different combination of ADB staples and quantities. Black pudding? Beans? Tea included? Double egg? Prob'ly a sign of my inner geek that I'd have preferred a tick list. Any road up, unassuming 1 for Andy, modest number 2 for me, gutbusting 8 for Grenvyle. 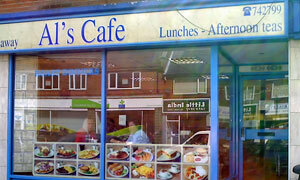 This being a no-frills establishment, we ordered at the counter and awaited our fry-ups. I think, ironicaly, that these premises were once home to Peachey's, a sports equipment shop. Not two shakes before a single saucer of toast emerged as tall as Cumberland Towers, swiftly followed by our big white plates. This is what we're talking about -- a meal worthy of a write-up on Egg Bacon Chips 'n Beans, except for the curious lack of chips. And with piping hot mushrooms. I'd got my eye on that last round of toast to mop my plate before Grenvyle dubiously nipped in to claim it: I demand a recount. That missed triangle of dough left me space for pudd, my eye having been fruitily drawn to a blow-up photo of apple pie and custard (summer is gone, as we've already concluded). Up again to the counter -- mind the gently sloping floor -- and a mug of tea too. Cuppa char comes with a spoon to fish out the milkily floating bag, as per all classy joints. My hot pie is drowned in custard, in a good way, and is sweetly satisfying. I was grateful for the cycle ride home. If it was a car -- Hillman Hunter. If they were passing by -- Bob Hoskins.